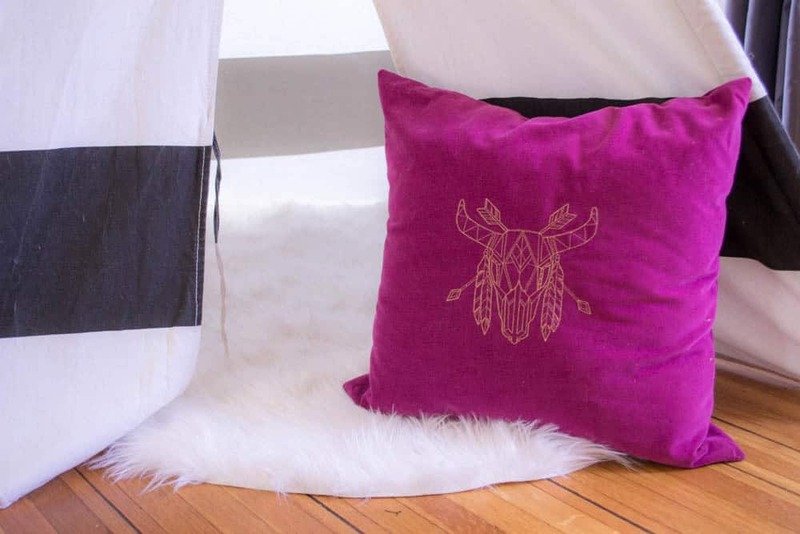 Y’all know we love machine embroidery (we even did a Machine Embroidery 101 post, and a How to Use an Embroidery Machine video) and sewing pillows (there’s about three trillion pillows tutorials in our Pretty Prudent Pillows category). I’ve been doing a lot of both as of late. 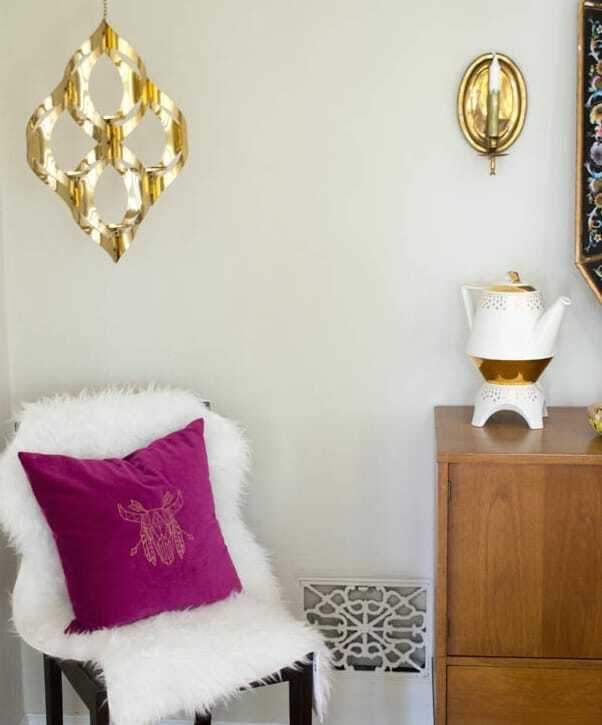 My sister-in-law (and other BFF, besides Jacinda), Stevee, recently moved to LA and has been in a decorating frenzy, getting her new place all situated for my husband’s twin and my niece and nephew. 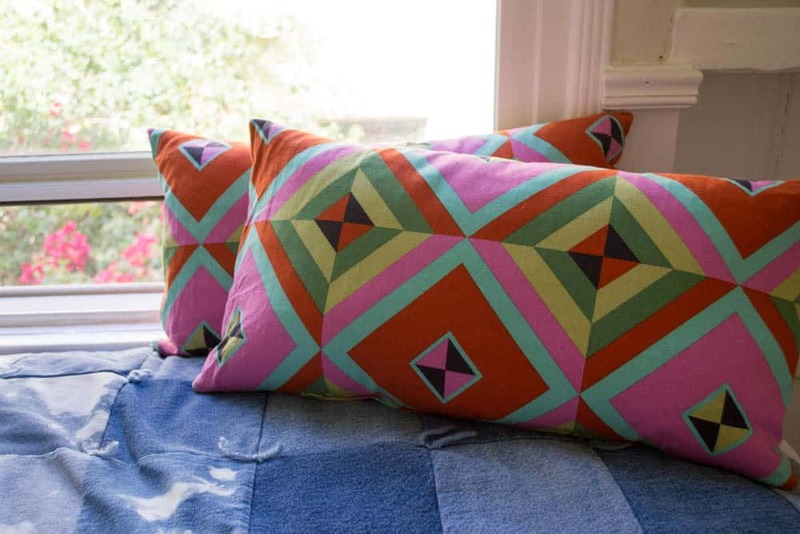 She asked me to whip up some pillows for her, and I was happy to oblige. First up is my favorite. I sewed this pillow for Stevee because she is obsessed with wolves. She just is, I can’t tell you why. 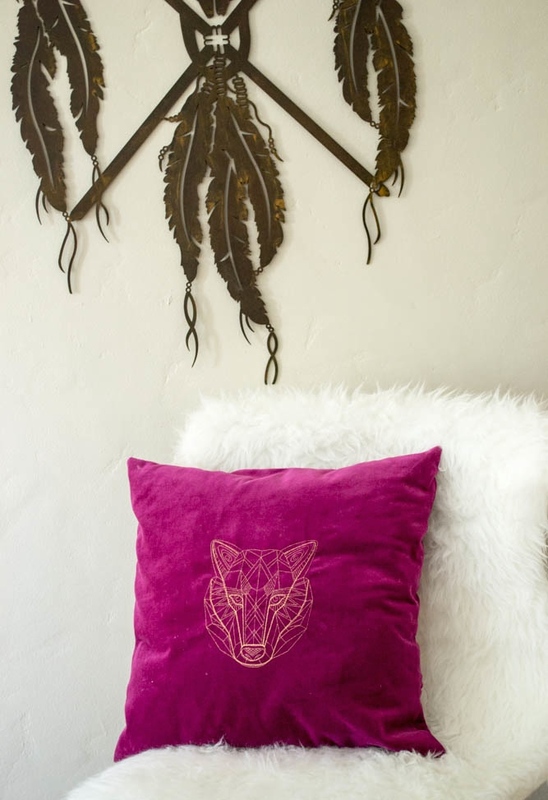 So of course I wanted to find her the perfect wolf to embroider, and I chose a luscious deep pink velveteen from my local fabric shop. I had to make it in metallic gold thread, because much like Macklemore, she’s feeling like GOLD (goldschlager faded, 14-carat plated). 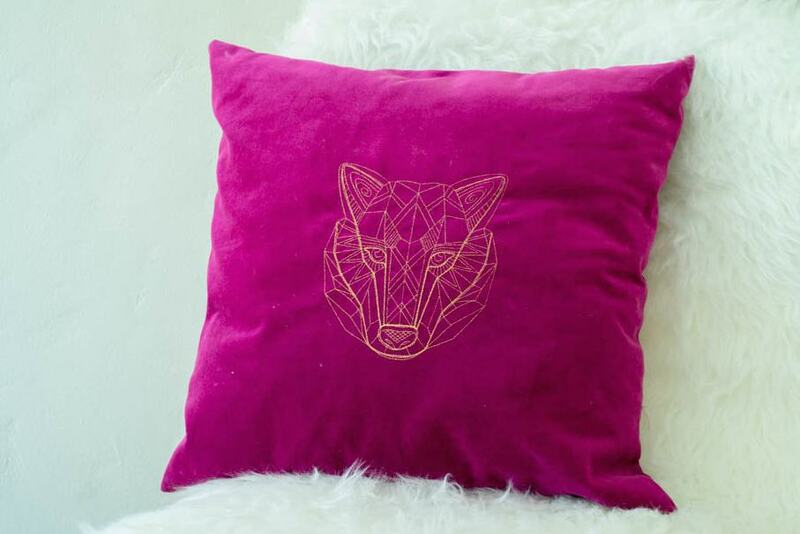 This pattern can be found on Urban Threads, it’s called Wild Wolf. Of course, one good wolf pillow deserves a friend. I chose this pattern to coordinate with an unauthorized Stevee-artwork-purchase to which I was a witness/accessory (once on a road trip from Nashville to Gatlinburg, she defied all non-spending orders from my BIL and snagged this steel-cut steer skull wall art), I decided to go with this classicly lined drawing known as Western Splendor. 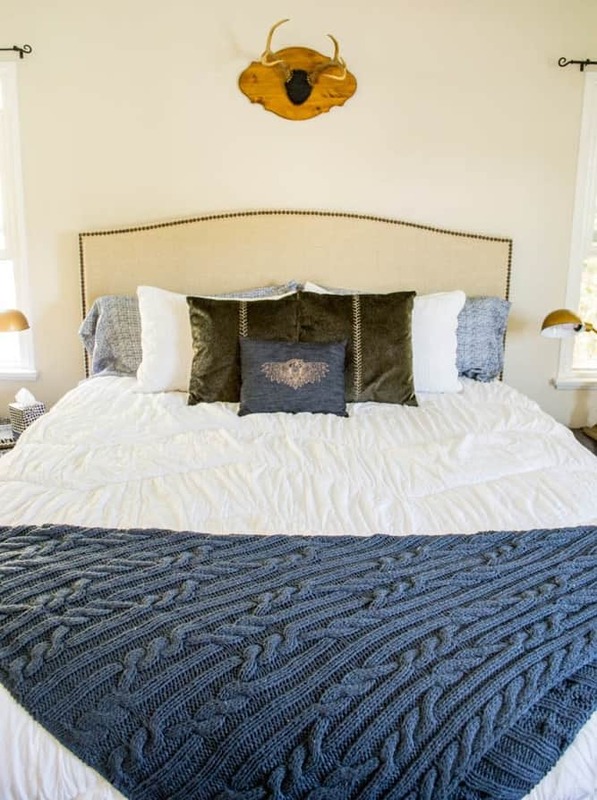 For her bedroom, she handed me a few yards of denim and told me to go to town. I wanted to pull the thread of gold-ness (Everything is gold, everything is equal/Posted on the porch just chillin’, me and my people) throughout the house, so I repeated the gold metallic thread with a similar light-stitched machine pattern called Raven’s Reach. 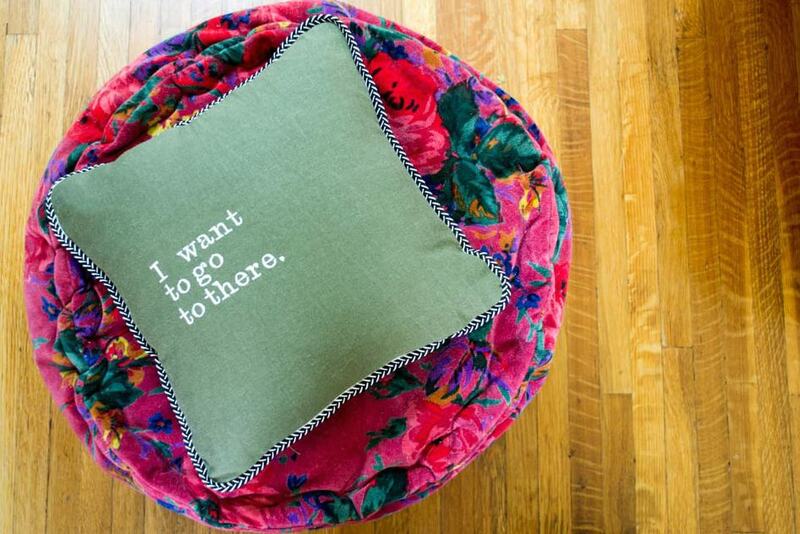 I adore this pillow. Here’s a pic where you can see the zipper, remember to just follow our (super-simple, super popular How to Sew a Zipper Pillow tutorial, or if you want to add shams, use our How to Sew a Sham Pillow with Zipper Closure tute, OR if you want to add piping or trim, use our How to Sew a Zipper Pillow with Piping tutorial). 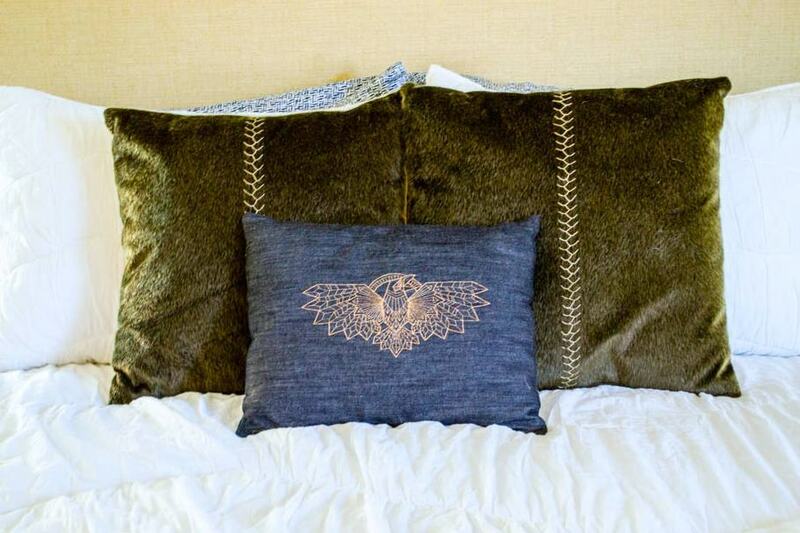 Also, I just made her some non-embroidered zipper pillows, though I totally want to grab some adhesive tear-away stabilizer and embroider them with SOMETHING. These are made with Amy Butler, Hapi, LINEN, Sky Pyramid Caramel from Fabricworm. 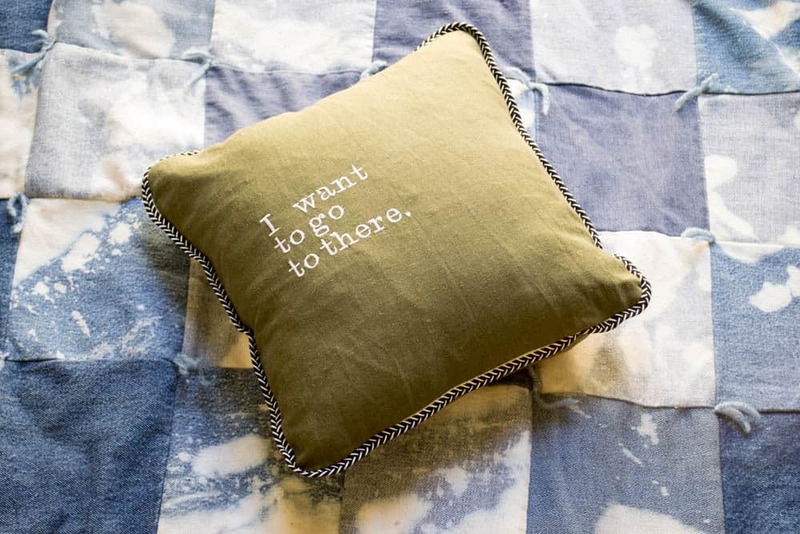 Of course, my favorite is still my Liz Lemon pillow, made with a font that comes with my embroidery machine and loving detailed with some piping (learn how to make one from our How to Sew a Zipper Pillow with Piping tutorial). I want to go to there. What do you think ladies, do you have the machine embroidery bug? What should I make for Stevee next?